A 'primocane' variety which produces fruit on new growth from August to October to pick in the first year. Extra large sweet juicy berries are delicious to eat and easy to pick as the canes are thorn free. 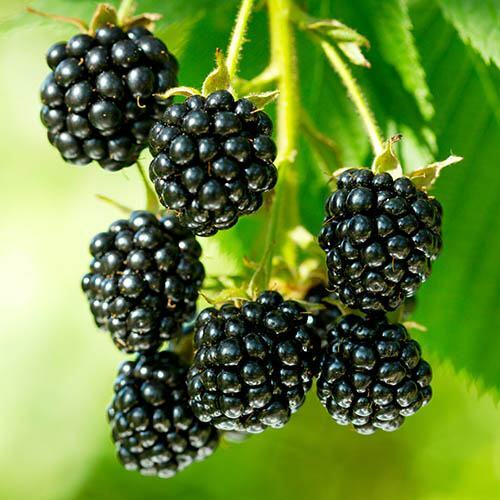 It's a 'primocane' variety which means it produces fruit on new growth from August to October and will produce crops to pick in the first year - much sooner than regular kinds. The extra large sweet juicy berries are delicious to eat and easy to pick as the canes are thorn free. The lovely white blooms which precede the berries are attractive to bees and butterflies too. Supplied as an established plant in 9 cm pot ready to plant into 5L pots.